Making fresh handmade bread daily and ready for delivery all around Phuket..
follow us on social networks to see latest bakery! Our sandwich store offers quality sandwiches and products at affordable prices. Enjoy our delicacies at the store or have us deliver to your house, office or even hotel. 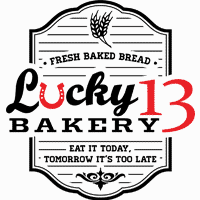 ©2017 LUCKY 13 GROUP. ALL RIGHTS RESERVED. WEB DESIGN BY E-MEDIA ASIA.